Become a member of the Toronto Postcard Club and connect with hundreds of other postcard collectors. Members receive ‘CARD TALK’, a 24-page magazine style newsletter that is all about vintage postcards, the history that they depict, and the stories about the publishers and photographers who created them. Many postcard images are reproduced in these articles. 3 issues are published annually, in Spring, Fall and Winter. (April, August and November). Members receive copies via the postal service. 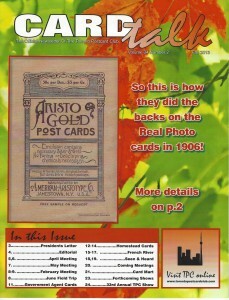 ‘CARD TALK’ also reports on club activities, club meetings and other items of interest to vintage postcard collectors. If you wish to pay using PayPal, please follow the instructions on the application form. Joe Bloggs Great Lakes ships and related. 123 Main Street Real Photo Postcards. is an advertising section in ‘CARD TALK’ in each of the three editions. Distribution is approximately 250 copies to members of the club who are dedicated postcard collectors, collectors in general and history buffs. Advertisements must be received at least 6 weeks prior to publication, preferably sized to the advertising space as noted following. Payment must accompany the ad request payable to THE TORONTO POSTCARD CLUB at the address noted above. Articles for ‘Card Talk’ from club members have priority, but we will accept any great articles about vintage postcards. Please note, if you’re submitting an article from another publication, or anything not written by yourself, we require permission from the original author. Please contact editor at torontopostcardclub dot com for more information. Error: Error validating access token: Session has expired on Friday, 12-Apr-19 20:21:58 PDT. The current time is Friday, 19-Apr-19 21:56:48 PDT.